iPhone 3G S in detail – on sale June 19 | What Hi-Fi? In a nutshell it's faster, has more storage capacity and a better 3MP camera, as well as longer battery life and voice recognition. Oh, and the ability to download videos directly from iTunes. The 'S' in the name apparently stands for "speed", with Apple's Phil Schiller saying it's the "fastest, most powerful iPhone yet". Battery life is boosted with up to nine hours of wi-fi web surfing, 12 hours talk time (2G) or five hours talk time (3G), 10 hours of video and 30 hours of audio. There are two versions, 16GB and 32GB, available exclusively through O2 for up to £184.98 and £274.23 respectively, depending on which tariff you choose. New software, iPhone V3.0, will be available from June 17th. This has around 100 changes, including the ability to download films and video directly to your iPhone, MMS and cut, copy and paste functionality. 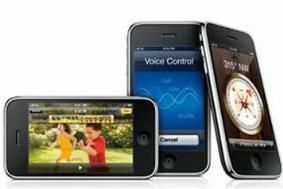 iPhone 3G S will also pack voice recognition, allowing you to make phone calls and control songs by speaking simple commands. The new camera can capture video and record in VGA at 30fps. For still pictures there's auto focus, auto white balance, auto macro and auto exposure, plus a tap-to-focus feature. Videos and pictures can be uploaded straight to YouTube, dropped into an email or sent over MMS. In addition, there's a tethered web connection that allows you to share your iPhone's 3G connection on Mac or PC via USB or over Bluetoth, but this costs extra. And we rather like the look of the new Tom Tom satellite navigation app, compass and 'Fine my iPhone' feature. The latter enables you to find your phone if you've lost it by logging into me.com and seeing it on a map. Very handy. The iPhone 3G S will be available from O2 stores and Carphone Warehouse from June 19th, although you can pre-order it exclusively at Carphone Warehouse this Wednesday (June 10th). Want to know more? Check out Tom Dunmore's hands-on blog over on Stuff.tv.